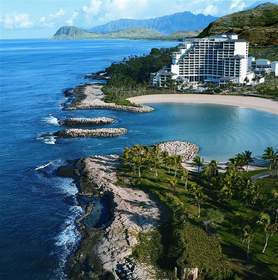 OAHU, HI--(Marketwire - Feb 22, 2013) - The luxurious JW Marriott Ihilani Resort & Spa at Ko Olina has available a room and tournament package starting at USD $419 for the 2nd annual LPGA Lotte Championship presented by J Golf. "We are excited to welcome once again the LPGA Lotte Championship to be held at nearby Ko Olina Golf Club," said Paul Toner, general manager of the newly renovated JW Marriott Ihilani Resort & Spa at Ko Olina. Ko Olina Golf Club will host the LPGA's 2013 Lotte Championship Presented by J Golf, with a field of players battling for a $1.7 million purse. The official four-day pro-round tournament with a 72-hole stoke play tees off from Sunday, April 14 to Saturday, April 20th. Ai Miyazato is the defending 2012 champion. To attend the LPGA Lotte Championship presented by J Golf, you can purchase tickets. Prices are $10 for daily tickets and $25 for a season badge good for admission throughout the week. Tickets are available for purchase at the Admissions Main Gate at Ko Olina Golf Club. Children under 16 years old are free when accompanied by a paid adult. For more information, visit the tournament's official website at www.lottechampionship.com. The luxurious JW Marriott Ihilani Resort & Spa at Ko Olina offers 387 spacious guest rooms including 36 suites, which have been completely transformed to feature a residential resort look-and-feel and upgraded amenities including a 42-inch flat screen LCD TV. The AAA Four Diamond award-winning resort fronts the first of four lagoons in the 640-acre Ko Olina Resort & Marina, offering the island's most complete resort experience with a relaxed Hawaiian elegance and gracious, warm personalized service. This Ko Olina hotel is ideal for meetings and weddings with a total of 77,694 square feet of outdoor and indoor meeting space, including the newly expanded 15,600-square-foot Hokulani Ballroom. Resort activities include 18 holes of championship play at Ko Olina Golf Club, tennis courts with ocean views and a variety of restaurants showcasing unique and distinctive island cuisine, including the AAA Four Diamond award-winning Azul restaurant. The world-class Ihilani Spa, voted one of the "Top Spas in the World" by readers of Conde Nast Traveler and Travel + Leisure magazines, has been completely redesigned with a new layout, couple's treatment room, the brand new Ho'onanea suite for private events, and a 24-hour fitness center. Ihilani Spa is internationally renowned for its full complement of invigorating body treatments and massages, using products harvested from the honua (earth) and the moana (ocean) here in the islands. The resort recently ranked as one of the "Top 15 Hawaii Golf Resorts" by Conde Nast Traveler, one of the "World's Best Hawaii Resorts" by Travel + Leisure, and number one in the Honolulu Star-Advertiser's "Best of the Best Hotel & Resort" poll voted by island readers. The luxurious JW Marriott Ihilani Resort & Spa at Ko Olina has available a room and tournament package starting at USD $419 for the 2nd annual LPGA Lotte Championship presented by J Golf.